Ninety percent of U.S. adults snack at least once per day, reports the U.S. Department of Agriculture, so chances are that most of your days include one or more snacks. High-fat, high-sugar snacks, such as cereal bars and snack cakes, can be high in calories and low in nutrients. Fat-free, sugar-free snacks can satisfy your hunger while helping you keep your calories in check and meet your nutrient requirements. Food manufacturers may label foods as fat-free if they contain less than 0.5 gram of fat per serving. Air-popped popcorn is a sugar-free food with less than half a gram of fat per cup. It is a source of dietary fiber, and consuming popcorn for a snack can help you meet your daily recommendations for whole-grain consumption. 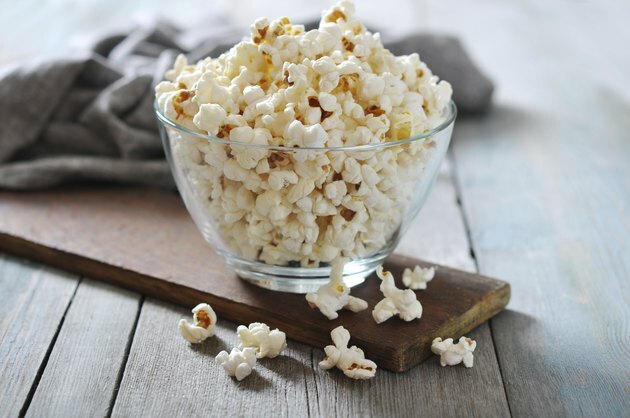 Eat your popcorn without butter to avoid adding saturated fat to your snack, and limit the salt that you add to limit your intake of sodium. Brown rice cakes and whole-wheat pretzels are alternative fat-free, sugar-free whole-grain snack options. Egg whites are virtually fat-free and sugar-free, and they provide high-quality protein. You can make hard-boiled eggs ahead of time and store them in the fridge so that you can peel and eat them when you are ready to eat a snack. Discard the yolk and eat only the white if you want to avoid all fat. Another snack idea is to slice cooked egg whites and add them to a salad with spinach leaves, red onion rings, cucumber slices and fat-free dressing. Canned light tuna in water and tuna in a pouch are convenient snack options because they do not require refrigeration before you open them. Tuna is sugar-free, and each 3-ounce serving contains less than 1 gram of fat. It provides iron, niacin, vitamin B-12 and vitamin D. It is also a source of omega-3 fatty acids, which may lower your risk for heart disease. Eat tuna plain or mix it with mustard, fat-free mayonnaise and diced onion and spread it on celery sticks. Many snack foods that contain fat, sugar or both are healthy. Nuts and peanuts are high-fat, but most of their fat comes from heart-healthy unsaturated fatty acids, and they also provide vitamin E and fiber. Lactose is a natural sugar in dairy products such as milk, yogurt and cheese, but these products are sources of calcium, vitamin B-12 and protein. Fruit contains a natural sugar called fructose, but most kinds of fruit are low-calorie and sources of dietary fiber, potassium and antioxidants. A balanced, healthy diet includes unsaturated fats and natural sugars.